Like most "Rock hounds" I have collected tumbled polished nugget stones. For quite awhile I just looked at them, now I have a way to use undrilled polished stones, in wire wrapped settings.. 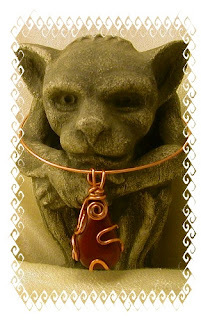 This is Irving the Gargoyle... ( I love Gargoyles! and have a small collection) and after much cajoling he agreed to model some of my stuff.. but he certainly doesn't look very happy about it! 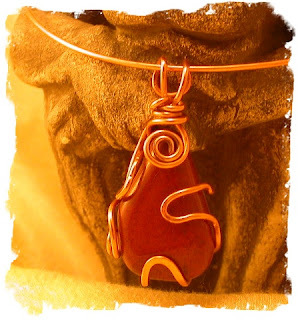 A red jasper in a 16ga copper wrap. I am not very good at this type of wire setting as is evidenced in the gaps between the stone and the wire, but it is secure and I am working on finding the right colors of agate and jasper beads to make a necklace to hang this from. Thanks Irving you're doing a heck of a job!